It is no secret that the drone industry in Africa is booming and the ever-changing technology is transforming industries like mining, agricultural, construction and water & forestry. 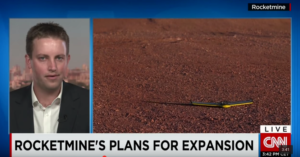 As the first commercial drone operator to receive its operating license in the mining industry, RocketMine’s operations caught the eye of Eleni Giokos of CNN Money who invited RocketMine’s MD, Chris Clark to comment on the drone industry in Africa. “Instead of transporting people, we are transporting data”, Chris Clark on RocketMine as a low-cost airline. “It’s all about getting data to the decision-makers as fast as possible”. The mining industry is explicitly complex because of the extent and nature of work. Mining and exploration companies often face challenge in accessing remote and unsafe topography. The inaccessibility results in no information of the area, unavailability of data and lastly remains unexplored. UAVs are turning the mining sector into an emerging frontier for new technology (IJIRSET, 2015). To receive a quote or more information on how drones can help you make better decisions, contact RocketMine on hello@rocketmine.com or 0861 123 738.